Hello readers! It is Book Talk Thursday over at Reading Toward the Stars, and I thought I'd share a few books for spring I love. Yes, I know technically it is winter, but we're in the deep freeze this weekend and we've had a snowy week here in Virginia. After a full week off from school, I'm ready now for warm weather. I booked a week at Topsail Beach for spring break (Big Smile) and I made plans to go to the TPT Conference in Las Vegas (Bigger Smile)...and my husband REALLY wants me to get back to work!! We haven't had a full week in a LONG time, and guess what...more rough weather coming! Best we can do is think warm thoughts, so therefore...warm books it is!! 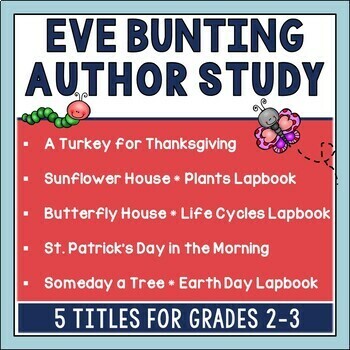 Sooo...in the spring, I think of Eve Bunting. I love a few books of hers in particular, and I'll share what I enjoy doing with them. The first is Someday a Tree. 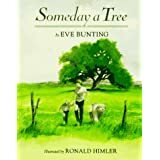 This book is about a special tree that sits on top of a hill on this families farm. They love sitting under it and creating special memories. Sadly, it gets sprayed with a chemical that ends up killing it. The book works very well with Earth Day and environmental studies, but the plot is great for modeling plot structure and cause/effect relationships. 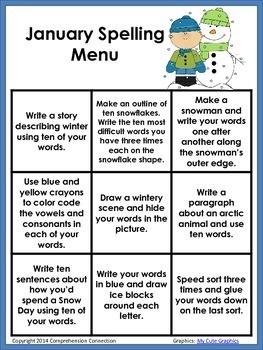 The themes that come from the book work well for the trait, ideas, if you teach Six Traits. 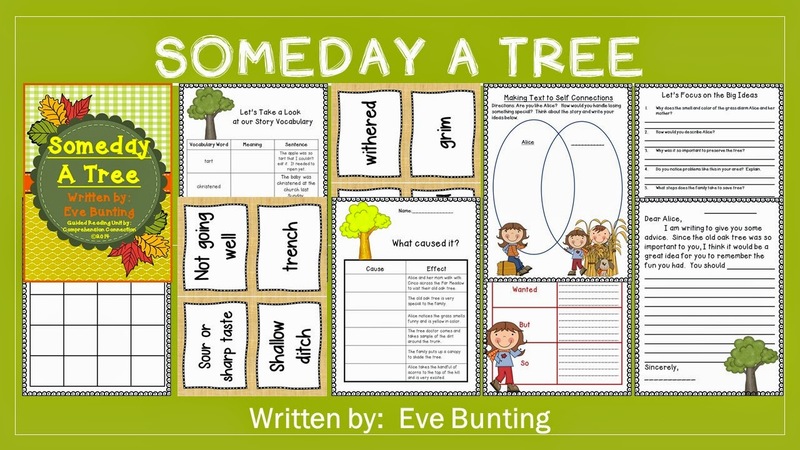 However, Bunting's writing style is also great for word choice and sentence fluency. This unit is available for the book in my store. 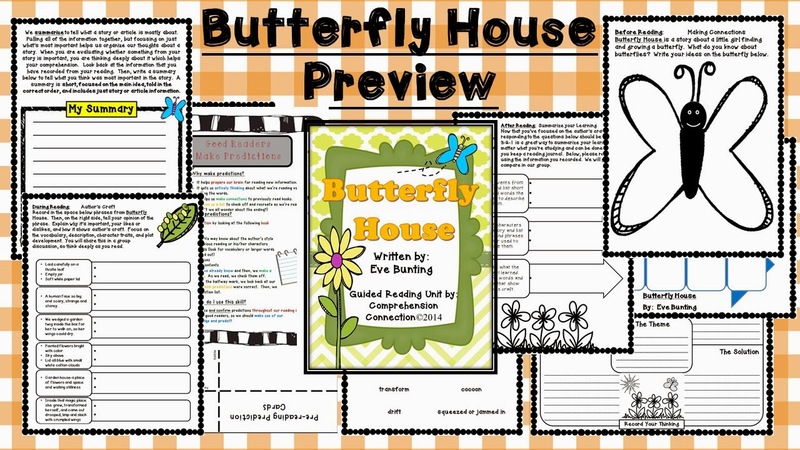 Another great Eve Bunting book I love is Butterfly House. I just love this book about a young girl and her grandfather. They grow butterflies, and their relationship is just touching. This book works well for Grandparents' Day or with writing about special things children do with older friends. Here is the preview of this unit. The last Eve Bunting book I use is Sunflower House. It is about some children who get creative with their sunflower planting. They make a clubhouse by planting the sunflower seeds in a circle. The plants grow up to form a hangout place in the middle. It reminds me of the times my sister and I would pull out the card table and tip over my mom's big rocking chair, cover them all with blankets to make our own "tent" for playing. We made such a mess of things! Here is the preview of this unit. As I mentioned at the start of my post, we've had all week off. I've done quite a bit of work and checked a few things off my list. One thing I've been meaning to do is send out a newsletter on TPT sharing the latest things I've done. Well, I got busy today and sent that out. I am sharing a little exclusive freebie in it, but in order to put the image in, I had to have an Image URL. Well, that means the image has to be uploaded to the web somewhere. 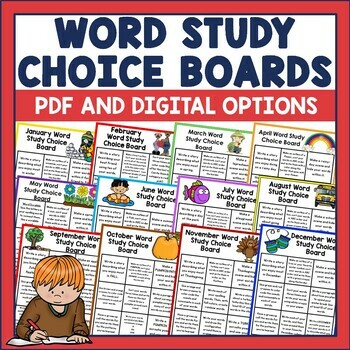 I figured this time I'd load it to my blog, so that means my blog readers get the freebie too! (Smiling??) 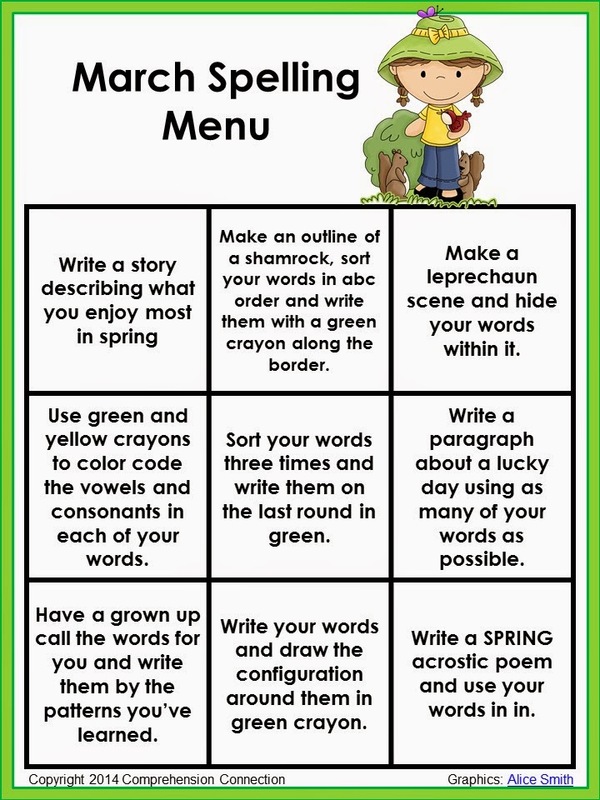 It is a March Spelling Menu. I have uploaded January and February to my store already, so if you'd like them, you can access them with the links below too. Have a happy Friday readers, and don't forget to check out this week's Thematic Thursday and more great book ideas over at Reading Toward the Stars. 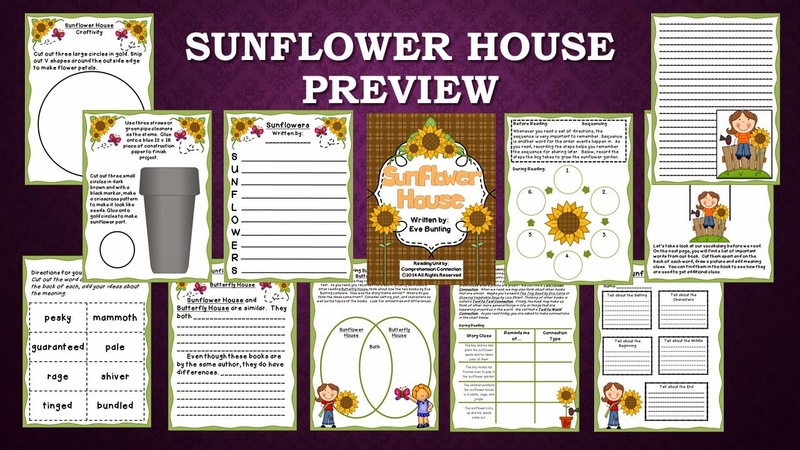 The Sunflower House is one of my favorite books! The kids were amazed that a circle of sunflowers could make a house! Definitely bookmarking this list... and hoping for spring! So glad you dropped by Haley! Thanks for commenting. If/when I get time. I really want to create other Bunting units. Love her books! Thanks so much for linking up again this week! I am definitely ready for spring now that we have had this major snow, and these books are perfect!